I know, it sounds kind of funny to think of sleeping on a pillow made of latex but that is probably because what comes to mind when we hear the word “latex” is a pair of thin, disposable gloves. But did you know that latex is actually a natural substance, and does not have to be synthesized in a factory and come with a chemical odor? Latex pillows can in fact be completely manufactured and sent to you without heavy metals and harsh chemicals and they may even give you a better night’s sleep than you ever expected. These pillows provide ample support and lasting comfort, and like memory foam, they can contour to the natural shape of your neck and head. Latex pillows can be made in a large block of foam or in a shredded foam style so that you can adjust the fill of the pillow to your preferences. What makes these pillows even more interesting is that they do not get hard in the cold the way memory foam pillows are prone to doing. The pillows will actually control the temperature and will not get colder or hotter in the night despite the lowering temperature or the heat from your body. This will keep you cooler at night even if you are a hot sleeper and tend to get night sweats, it won’t be a problem with latex. 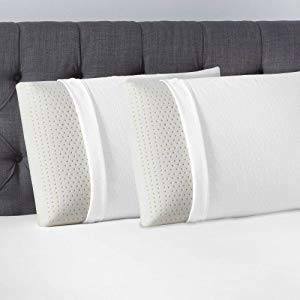 I like this pillow because it is highly comfortable, durable and does not have a strong odor on top of the fact that you can remove the cover and easily wash the cover any time you need to. But also for this reason. All natural cotton: The all natural cotton cover on every single pillow makes them easy to wash as well as very breathable to keep the pillow, and you, cool throughout the evening. 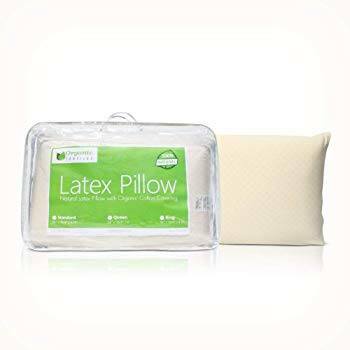 All natural latex: The all natural latex keeps the odor off of the pillow and makes them antimicrobial as well as hypoallergenic which is better for your breathing and health. Durable: These pillows are designed to be long term use, holding up to constant, nightly use without going flat. 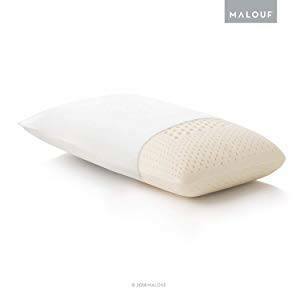 With these pillows by Malouf, you can choose to order either a high loft or low depending on which is more comfortable with your sleeping position. Higher lofted pillows are normally suggested for those who sleep on their backs or for side sleepers while the low loft pillows are more comfortable for stomach sleepers. You can also choose a firm or plush pillow, the firm ones obviously being more firm and the plush being a softer feel. The pillow is naturally resistant to mildew and dust mites which keeps it fresher, longer. The latex is made from all natural latex coming from trees and the cover is made from all natural, 100% cotton that is airy and very breathable. This is another natural option for a latex pillow from Beautyrest that gives you extreme comfort as well as support. Your options for ordering are either a standard, queen or king sized pillow and you can order a single or two pack of pillows. The casing of every pillow is made from 100% natural cotton that is wrapped around the all natural latex foam. The pillow is antimicrobial and does not hold an odor, it is breathable and allows for airflow to keep cool, and in the event it does get sweaty or dirty you can easily remove and wash the case in the washing machine. Brooklyn Bed’s latex pillow is made to be completely natural right in the heart of America, holding to careful regulations and standards. You can order your pillow with the firmness you truly need, from soft, medium or firm. 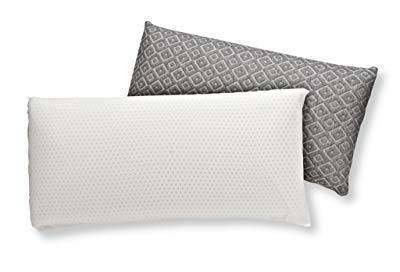 The pillows come with a bamboo cover that is in a dark grey color and very fashionable and can be washed but can also easily be covered by another cover. Your pillow can be cleaned and freshed and even after years of use it will withstand and hold up to the test. If you are looking for a latex pillow that acts much like memory foam then this one is your best bet. It is made of all natural latex and covered in a natural, washable and breathable, cotton cover that is soft against your skin. The pillow can take a lot and will conform to your head and neck while being very resilient to however you intend to use it otherwise. You can use the pillow as often as you want because it is very durable and holds up to both nightly and daily use. If you like latex pillows and you are a side sleeper this may be the very best option for you as it is very thing but does not skimp on quality. The pillow is made with the natural latex and it is hypoallergenic and antimicrobial as well as mildew resistant. The cover of the pillow is cotton and easy to remove and wash and helps to keep you cool along with the aerated design that promotes airflow. The pillow measures 2.75 inches tall allowing for you to comfortably sleep on your stomach throughout the night. Maybe you came into this thinking that latex pillows sound ridiculous and they are absolutely not for you, but I hope you’ve had a bit of a change of heart. Latex pillows can actually be high quality, comfortable and truly supportive for your cervical vertebrae and your head. If you are looking for a more hypoallergenic option, you can shoot for the natural latex options that come without synthetics and are more eco friendly. You can look for options that have shredded latex options where you can make your pillow fully adjustable, making it a customized experience for you. Latex pillows designed to be breathable are often very good at promoting airflow and if you are a hot sleeper i highly recommend you giving them a chance as they allow for airflow and do not get hot or cold, but rather keep the cool feel they always have. You can relax and know that the pillow will give you a more ergonomic support and get you sleeping faster, deeper, longer and keeping you asleep better.